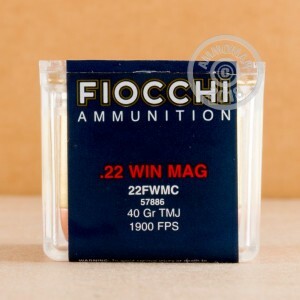 This .22 WMR rimfire ammunition from Fiocchi is a great choice for target shooting in your rifle or pistol. These cartridges come in sturdy 50-round plastic boxes and fire a copper-plated 40 grain bullet at 1,900 feet per second. 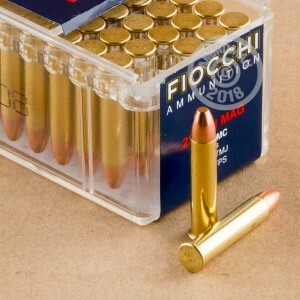 Fiocchi rimfire ammunition is manufactured in Lecco, Italy and enjoys a great reputation for reliability. Grab a few boxes of this ammo (or any items totaling over $99) from AmmoMan.com to qualify for free shipping! Great for stocking up, especially since 22 mag ammo is so hard to find at a reasonable price.